Transcutaneous oxygen pressure measurement (TcPO2) has been used in human for years.,,,,, The absolute value of TcPO2 is generally accepted as part of the definition of critical ischemia in Fontaine Stages 3 and 4, where cutaneous oxygen supply is altered. Since our first study published in 2003, we have used exercise oximetry not only at rest from critical limb ischemia ,, but also at exercise to confirm the arterial origin of limb pain in patients complaining exercise-induced lower limb pain or discomfort when walking.,, The present review illustrates the issues, difficulties that arise about this underused clinical approach. Most available systems use a “Clark type” electrode. In a Clark-type electrode, the system includes a platinum cathode and a silver anode immersed in an electrolyte solution. The electrodes are protected by an oxygen permeable membrane. As the platinum cathode is polarized, oxygen becomes reduced at the cathode surface and acts as an electron acceptor. The current indicates oxygen concentration and pressure. Recently, a German manufacturer launched a probe based on a photo-reactive concept where the light from a green light-emitting diode excites the sensor spots of a matrix layer to emit fluorescence. If the sensor spot encounters an oxygen molecule, the excess energy is transferred in a nonradiative way, quenching the fluorescence signal. The degree of quenching correlates to the partial pressure of oxygen in the matrix, which is in dynamic equilibrium with oxygen in the sample. Both systems are measuring oxygen concentration (partial pressure) and should not be confused with the near-infrared spectrometry approach that measures hemoglobin saturation and not tissues partial pressure for oxygen through the absorption of infrared light by hemoglobin. Transcutaneous measurement of oxygen pressure correlates fairly well with systemic PO2 in neonates., Unfortunately, in adults, the skin thickness results from a transcutaneous gradient and the surface oxygen pressure is lower than the pressure of oxygen in underlying tissues. One important point here is to keep in mind that the unpredictable gradient which results in surface PO2 being lower that tissue PO2 in the adult, is assumed to be constant over time within an experiment. During exercise TcPO2 recordings, a chest electrode is generally used, to take into account eventual systemic PO2 changes. This is of particular interest to confirm that local inadequate oxygen supply to fulfill oxygen demand is due to an abnormal blood flow supply and normal systemic oxygen content or to a normal blood flow supply but low oxygen content of the blood due to systemic hypoxemia. The arterial PO2(and then TcPO2) in normal or diseased patients may either increase (due to improved ventilation/perfusion ratio during moderate exercise) or decrease (due to the obstructive or diffusive lesions in the lungs). In the aging population studied, chronic airway diseases are far from being rare. Previous studies have proven that although the transcutaneous to arterial PO2 difference may change from one experiment to another, this difference remains constant during moderate exercise within an experiment thus allowing for continuous monitoring of PaO2 absolute changes over time (although not providing absolute instantaneous values)., The concordance of TcPO2 changes (regardless of starting value) with absolute arterial changes (regardless of starting absolute value) to monitor systemic PO2 changes has been largely validated. Typical examples of simultaneous chest recordings are shown in [Figure 1]. As shown the absolute value may differ, but changes over time are identical. 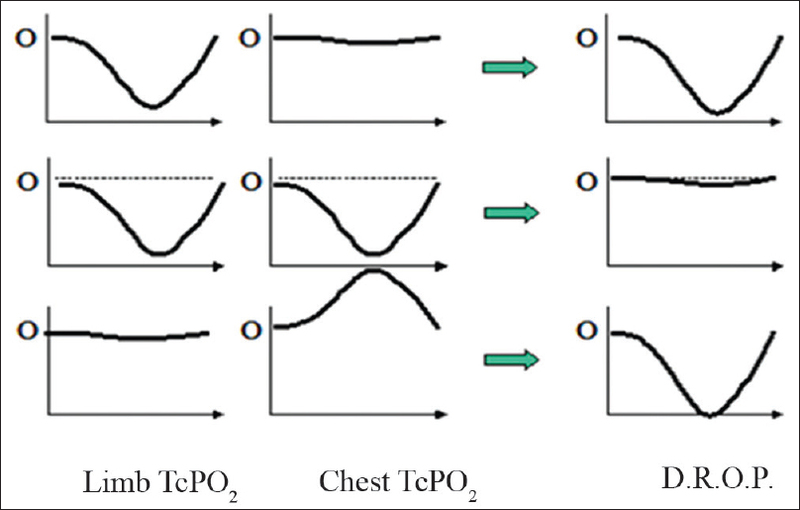 Analyzing chest changes have resulted in the classification of likely normal Types A and B, and of Type C or Type D chest-TcPO2 profiles that are likely to result from abnormal responses. The meaning of DROP is Delta from Rest of Oxygen Pressure. There are two ways to account for chest PO2 changes. Originally, the one used in the past was to calculate the ratio of limb to the chest, generally referred to as the regional perfusion index (RPI). This RPI has no unit (it is a percent value) and is dependent on the transcutaneous gradient as we previously showed. We do not use it. We use the change from rest (Delta from Rest) of oxygen pressure, which is expressed in mmHg and is inherently independent of the initial transcutaneous gradient as described in our original publication. To calculate DROP, we first calculate the instantaneous value minus resting value at both the limb and chest level. This generally results in a negative value at the limb since in most cases PO2 remains stable or decreases at exercise at the limb level. This often results in a positive value at the chest except in some cases of exercise-induced systemic hypoxemia. Then, we subtract chest changes to limb changes. Thus, if the chest is converted to absolute values, chest changes are added to the negative limb changes when chest TcPO2 increase or subtracted, if chest TcPO2 decreases. As a result, if chest and limb changes are the same due to exercise-induced systemic hypoxemia, the DROP will remain unchanged, though absolute values may decrease. This is clearly of interest to differentiate limb decrease resulting from regional abnormal blood flow supply from those resulting from systemic PO2 changes. The following [Figure 2] illustrates schematic results for DROP calculation. For example, during exercise TcPO2a stable thoracic value can be associated with a 20 mmHg decrease of buttocks values or inversely of stable buttocks value with a 20 mmHg systemic PaO2 increase. In the first case, DROP would be minus 20 mmHg, whereas it would be zero in the second case since buttocks changes directly reflect systemic changes. Inversely stable absolute buttocks values can result in a negative DROP value if thoracic (and then systemic) PO2 increases. For another example, the absence of increase of buttocks values while thoracic TcPO2 increases by 20 mmHg, likely are due to peripheral insufficient perfusion and would result in a DROP value at that buttock of minus 20 mmHg, as well. In evaluating arterial disease, X-ray (arteriography or computed tomography scan) is the “goldstandard.” This is the reason why we studied the ability (sensitivity and specificity.,) of TcPO2 to detect arteriographically proven lesions in patients suspected of proximal claudication, and not on the contrary to study the relationship between TcPO2 and proximal pain in patients with/without the hypogastric arterial disease. Consistently, we have shown that ultrasound which is generally used as a routine investigation in peripheral artery disease (PAD) fails to detect many arterial lesions in patients with proximal claudication. There is no reason that all severe lesions should result is regional ischemia due to the presence of collateral (vicariate) vessels. Then, one should not expect a 100% sensitivity of Ex-TcPO2 compared with imaging. Roughly, Ex-TcPO2 is to be considered a test of the responsibility of PAD in exercise-related symptoms. The presence of radiographically significant arterial lesions is not necessarily proof that they are responsible for the clinical symptoms. Indeed, due to the frequent association of osteoarticular lumbar or hip lesions and proximal vascular diseases (as clearly illustrated by the studies of L Kauppila),,,,, there is numerous situation where proximal exercise-induced pain may be partly of nonvascular origin in vascular patients. Similarly, ischemia at one specific site can perfectly remain asymptomatic in more severe ischemia at another site (say the calf) results in pain at the other site masking pain at the buttock level. Then, in the validation approach of Ex-TcPO2, the reference cannot be the presence of pain. Ankle to brachial index (ABI) is cheaper, technically easy, and accessible. Approximately 13.6% of PAD patients have arterial stiffness. Before it results in noncompressible arteries, stiffness may lead to an overestimation of ABI. There is strictly no reason why stiffness shall interfere with results at rest and would not interfere with postexercise results. Then, using an exercise test independent from arterial stiffness is of major interest. Finally, 30% of the patients with arterial claudication and a normal ABI have a decrease below 0.9 after exercise. Although the normal limits to be used in exercise TcPO2 have been clearly defined at the calf and buttock,, there is no consensus as to the normal limit to be used for postexercise ABI as clearly reported recently by Mahé et al. One very interesting and original point about doing Ex-TcPO2 and not postexercise ABI is the observation of normal TcPO2 results in patients with abnormal resting ABI. To the best of our knowledge, no normal postexercise ABI has even been reported in patients with abnormal resting ABI. We recently reported  the frequency of these observations and underlying conditions for this, among which: proximal claudication and exercise-induced systemic hypoxemia. Proximal ischemia is also one of the major cause of exercise-induced pain in patients with a normal ankle to brachial index at rest  and abnormal chest changes at exercise suggesting impaired systemic oxygenation during exercise which is found in approximately 15% of the patients referred for claudication in our experience. This does not necessarily mean that the patients do not have PAD but rather that many suffer walking limitation from the nonPAD origin. Thermography has been proposed to objectively measure muscle activity during exercise. It could be proposed to analyze the expected cooling of the diseased leg as compared to the normally perfused leg during exercise., There are few reports confirming the possibility of measuring this phenomenon as well as the “warm knee paradox in popliteal occlusions,”, using thermographic infrared cameras. In our opinion, the accuracy of the system and sensitivity to environmental conditions make this approach of low interest. Although it is intended to measure muscle values, which are a great advantage as compared to surface TcPO2, near-infrared spectroscopy (NIRS) measures saturation and the sigmoidal relationship of saturation to pressure for oxygen is an important pitfall for the technique. The research with NIRS during exercise in arterial disease remains limited and limited data are available using bilateral measurements during exercise.,,, The use of NIRS on the buttocks might not be a favorable site for NIRS measurement due to subcutaneous fat thickness. This might explain a lower performance as compared to Ex-TcPO2, at least at the buttock level. The penile brachial index may be useful for an obviously limited population. At present, it can be routinely used in male patients for the impotence of suspected vascular origin., Since penile pressure measurements are frequently performed, as in our laboratory, with plethysmography rather than Doppler, it would not differentiate between the right and left side. The Doppler is expected to be more side specific, but frequent anatomical variations and anastomoses can be seen which makes the sensitivity and specificity debatable in the case of unilateral lesions. Finally, the results could hardly be obtained during walking. Last, we showed that penile pressure is not relevant to the hypogastric circulation. Beyond the interest of the technique for injected visualization of vessels before surgery, the recent development of magnetic resonance imaging has led to some interesting physiological research in the field of limb blood flow and limb muscle metabolism in exercise physiology.,,,, Nevertheless, accessibility and cost limit the development of the technique for exercise investigations. Last, it is not possible to measure the moving leg during walking. Using muscle scintigraphy allows for the evaluation of muscle blood flow but does not analyze oxygen pressure in the muscle., The ability of scintigraphy to estimate the perfusion segment by segment and differentiate buttock from the thigh from calf perfusion is clearly of interest.,,,, Accessibility, cost, and irradiation all remain limitations of this tool that can mainly remain a research technique. Calf pain can be caused by nonvascular diseases, such as neurologic claudication, sciatica or neuromuscular, or osteoarticular symptoms. Further, isolated proximal–noncalf-ischemia can explain a normal calf TcPO2 result but can induce pain involving the calf. A specific interest of the technique is the estimation of abnormal perfusion in areas that are hardly accessible to ultrasound recording (buttock circulation).,,, A second interest is the detection of systemic hypoxemia as a potential cause of walking impairment associated with PAD.,,, Nevertheless no evidence exists to date that Ex-TcpO2 participates in a better outcome of detected patients. The last situation of specific interest is the patients with uncompressible arteries where ABI postexercise cannot be performed (i.e., diabetic patients or patients with renal failure that are at high risk of lower limb vascular calcifications). The results of exercise oximetry in diabetic versus nondiabetic patients  show that patients with diabetes show more severe limitation on the treadmill and more nonlimb symptoms, and more distal ischemia than patients without diabetes, with no difference at the buttock level. The method proposed to perform an exercise oximetry test has been largely described elsewhere., The following items are only some keypoints to guide potential users that would start developing the technique. Always check the chest changes when interpreting DROP results. Typical examples of exercise oximetry results are reported in [Figure 3]a,[Figure 3]b,[Figure 3]c. Many points still need to be clarified about the use of exercise oximetry. Among these: the cost-effectiveness of the technique; the position among other tools in the diagnostic algorithm of exertional limb pain of suspected vascular origin; the definition of the population that should undergo this procedure. On the one hand in medicine, physicians cannot satisfy of the presence of a lesion at rest to claim that this lesion is responsible for the symptomatology of the patients. In PAD patients, it is well known that patients with femoral occlusion may remain perfectly asymptomatic and not only because of the absence of physical activity. On the other hand, nobody would accept that chest angina is excluded on the basis of a normal resting electrocardiogram. As in any exercise-related disease, a resting normal Doppler and a resting ABI within the normal limits should not lead to the conclusion that the lower limb symptoms are not of arterial origin. Finally, the frequent situations where comorbid conditions coexist in the same patient questioning which disease is the principal responsible for the patient complains of walking impairment. The technique is simple and can be performed by a technician or a nurse under medical supervision but remains time-consuming. In our opinion, diagnostic exercise testing in general, and diagnostic exercise oximetry specifically remain largely underused and when performed, significantly impacts patient care. Claudication is an exercise-related symptom and relying on resting investigation to diagnose and evaluate patients suffering lower limb exertional pain should no longer be the dominant practice. The authors would like to thank I; Laporte and M Feuilloy for technical help. Breuer HW, Breuer J, Berger M. Transcutaneous oxygen pressure measurements in type I diabetic patients for early detection of functional diabetic microangiopathy. Eur J Clin Invest 1988;18:454-9. Weiss T, Griesshaber J, Rogatti W, Kistner O, Hsu E, Jansen T, et al. Effect of intra-arterial and intravenous PGE1 infusions on transcutaneous oxygen pressure in patients with critical ischemia of the extremities. Vasa Suppl 1991;33:341-2. Claeys LG, Horsch S. Transcutaneous oxygen pressure as predictive parameter for ulcer healing in endstage vascular patients treated with spinal cord stimulation. Int Angiol 1996;15:344-9. Got I. Transcutaneous oxygen pressure (TcPO2): Advantages and limitations. Diabetes Metab 1998;24:379-84. Hauser CJ, Shoemaker WC. Use of a transcutaneous PO2 regional perfusion index to quantify tissue perfusion in peripheral vascular disease. Ann Surg 1983;197:337-43. Ambrosi C, Gérard R. Transcutaneous measurement of PO2 in healthy subjects and in arteriopathy patients during the exercise test. J Mal Vasc 1985;10:37-42. Abraham P, Picquet J, Vielle B, Sigaudo-Roussel D, Paisant-Thouveny F, Enon B, et al. Transcutaneous oxygen pressure measurements on the buttocks during exercise to detect proximal arterial ischemia: Comparison with arteriography. Circulation 2003;107:1896-900. Khodabandehlou T, Vimeux M, Le Dévéhat C. Measurements of transcutaneous oxygen pressure and changes in blood rheology as markers of prognosis of critically ischemic limb in diabetes mellitus patients. Int J Low Extrem Wounds 2003;2:13-8.
de Graaff JC, Ubbink DT, Legemate DA, Tijssen JG, Jacobs MJ. Evaluation of toe pressure and transcutaneous oxygen measurements in management of chronic critical leg ischemia: A diagnostic randomized clinical trial. J Vasc Surg 2003;38:528-34. Nishio H, Minakata K, Kawaguchi A, Kumagai M, Ikeda T, Shimizu A, et al. Transcutaneous oxygen pressure as a surrogate index of lower limb amputation. Int Angiol 2016;35:565-72. Bouyé P, Picquet J, Jaquinandi V, Enon B, Leftheriotis G, Saumet JL, et al. Reproducibility of proximal and distal transcutaneous oxygen pressure measurements during exercise in stage 2 arterial claudication. Int Angiol 2004;23:114-21. Abraham P. Transcutaneous oxygen pressure measurements (tcpO2) at ankle during exercise in arterial claudication. Am J Physiol Heart Circ Physiol 2005;24:80-8. Grouiller F, Jaquinandi V, Picquet J, Souday V, Saumet JL, Abraham P, et al. Validation of a new device for transcutaneous oxygen pressure recordings in real and simulated exercise tests. Int Angiol 2006;25:190-6. Modesti PA, Boddi M, Gensini GF, Serneri GG. Transcutaneous oximetry monitoring during the early phase of exercise in patients with peripheral artery disease. Angiology 1990;41:553-8. 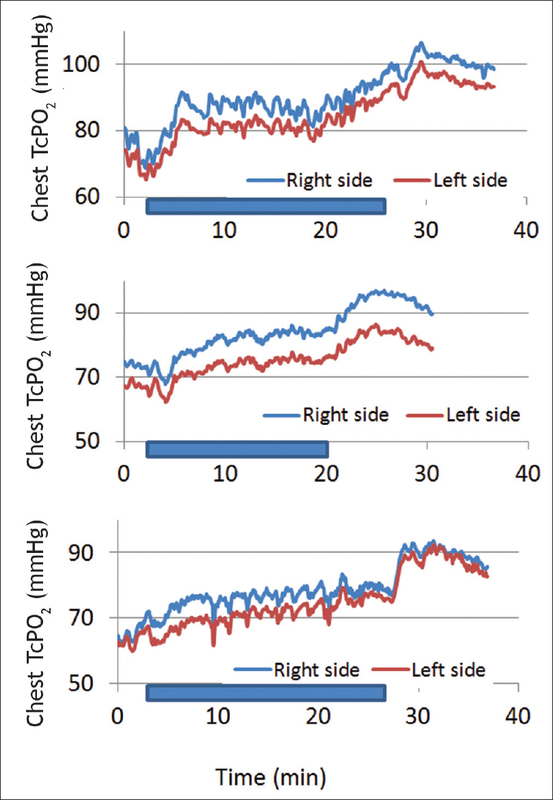 Schmidt JA, Bracht C, Leyhe A, von Wichert P. Transcutaneous measurement of oxygen and carbon dioxide tension (TcPO2 and tcPCO2) during treadmill exercise in patients with arterial occlusive disease (AOD) – Stages I and II. Angiology 1990;41:547-52. Mouren X, Caillard P, Bensoussan JJ, Massonneau M, Gamand S, Stevens WH, et al. The effect of naftidrofuryl on transcutaneous oxygen tension during a treadmill test in patients with peripheral arterial occlusive disease. Vasc Med 1998;3:9-14. Liu Y, Steinacker JM, Stauch M. Transcutaneous oxygen tension and doppler ankle pressure during upper and lower body exercise in patients with peripheral arterial occlusive disease. Angiology 1995;46:689-98. Rosfors S, Celsing F, Eriksson M. Transcutaneous oxygen pressure measurements in patients with intermittent claudication. Clin Physiol 1994;14:385-91. Mahé G, Ouedraogo N, Leftheriotis G, Vielle B, Picquet J, Abraham P, et al. Exercise treadmill testing in patients with claudication, with and without diabetes. Diabet Med 2011;28:356-62. Mahe G, Kalra M, Abraham P, Liedl DA, Wennberg PW. Application of exercise transcutaneous oxygen pressure measurements for detection of proximal lower extremity arterial disease: A case report. Vasc Med 2015;20:251-5. Henni S, Mahe G, Lamotte C, Laurent R, Riviere AB, Aubourg M, et al. Exercise transcutaneous oximetry significantly modifies the diagnostic hypotheses and impacts scheduled investigations or treatments of patients with exertional limb pain. Eur J Intern Med 2018;52:28-34. Caillard P, Mouren X, Pujade B, Blanchemaison P, Elbeze Y, Cloarec MP, et al. Objectifying exercise ischemia in peripheral vascular disease: A study in 120 patients. Angiology 1990;41:469-78. Provan JL, Ameli FM. Transcutaneous oxygen tension during exercise in patients with claudication. Br Med J (Clin Res Ed) 1986;293:629. Horbar JD, Clark JT, Lucey JF. The newborn oxygram: Automated processing of transcutaneous oxygen data. Pediatrics 1980;66:848-51. Finer NN, Stewart AR. Continuous transcutaneous oxygen monitoring in the critically ill neonate. A controlled clinical trial. Crit Care Med 1980;8:319-23. Planès C, Leroy M, Foray E, Raffestin B. Arterial blood gases during exercise: Validity of transcutaneous measurements. Arch Phys Med Rehabil 2001;82:1686-91. McDowell JW, Thiede WH. Usefulness of the transcutaneous po2 monitor during exercise testing in adults. Chest 1980;78:853-5. Colas-Ribas C, Signolet I, Henni S, Feuillloy M, Gagnadoux F, Abraham P, et al. High prevalence of known and unknown pulmonary diseases in patients with claudication during exercise oximetry: A retrospective analysis. Medicine (Baltimore) 2016;95:e4888. Ouedraogo N, Barbeau C, Legrand M, Marchand J, Leftheriotis G, Abraham P, et al. “Routine” arterial echo-doppler is not sufficient to exclude an arterial origin of exercise-induced proximal lower limb pain. Int J Cardiol 2013;167:1053-4. Kauppila LI. Prevalence of stenotic changes in arteries supplying the lumbar spine. A postmortem angiographic study on 140 subjects. Ann Rheum Dis 1997;56:591-5. Kauppila LI. Atherosclerosis and disc degeneration/low-back pain – A systematic review. Eur J Vasc Endovasc Surg 2009;37:661-70. Kauppila LI, Mikkonen R, Mankinen P, Pelto-Vasenius K, Mäenpää I. MR aortography and serum cholesterol levels in patients with long-term nonspecific lower back pain. Spine (Phila Pa 1976) 2004;29:2147-52. Kauppila LI, Penttilä A, Karhunen PJ, Lalu K, Hannikainen P. Lumbar disc degeneration and atherosclerosis of the abdominal aorta. Spine (Phila Pa 1976) 1994;19:923-9. Kauppila LI, Tallroth K. Postmortem angiographic findings for arteries supplying the lumbar spine: Their relationship to low-back symptoms. J Spinal Disord 1993;6:124-9. Stein R, Hriljac I, Halperin JL, Gustavson SM, Teodorescu V, Olin JW, et al. Limitation of the resting ankle-brachial index in symptomatic patients with peripheral arterial disease. Vasc Med 2006;11:29-33. Abraham P, Picquet J, Bouyé P, L'Hoste P, Enon B, Vielle B, et al. Transcutaneous oxygen pressure measurements (tcpO2) at ankle during exercise in arterial claudication. Int Angiol 2005;24:80-8. Mahe G, Pollak AW, Liedl DA, Cohoon KP, Mc Carter C, Rooke TW, et al. Discordant diagnosis of lower extremity peripheral artery disease using American Heart Association Postexercise Guidelines. Medicine (Baltimore) 2015;94:e1277. Signolet I, Henni S, Colas-Ribas C, Feuilloy M, Picquet J, Abraham P, et al. Prevalence and causes of normal exercise oximetry in the calf in patients with peripheral artery disease and limiting calf claudication. Eur J Vasc Endovasc Surg 2016;51:572-8. Bruneau A, Feuilloy M, Dussaussoy C, Gagnadoux F, Leftheriotis G, Abraham P, et al. The walking-induced transient hack concept is valid & relies on a transient early-exercise hypoxemia. PLoS One 2013;8:e62651. Gernigon M, Marchand J, Ouedraogo N, Leftheriotis G, Piquet JM, Abraham P, et al. Proximal ischemia is a frequent cause of exercise-induced pain in patients with a normal ankle to brachial index at rest. Pain Physician 2013;16:57-64. Fernandes Ade A, Amorim PR, Brito CJ, Sillero-Quintana M, Bouzas Marins JC. Regional skin temperature response to moderate aerobic exercise measured by infrared thermography. Asian J Sports Med 2016;7:e29243. Portig I, Maisch B. Noninvasive methods in the diagnosis of macro- and microangiopathy of peripherial and carotid arteries. Herz 2004;29:17-25. Huang CL, Wu YW, Hwang CL, Jong YS, Chao CL, Chen WJ, et al. The application of infrared thermography in evaluation of patients at high risk for lower extremity peripheral arterial disease. J Vasc Surg 2011;54:1074-80. O'Brien DP, Walsh TN, Given HF. The warm knee sign – An evaluation. Eur J Vasc Surg 1990;4:531-4. Evans AL, James WB, Forrest H. Thermography in lower limb arterial disease. Clin Radiol 1976;27:383-8. Luck JC, Miller AJ, Aziz F, Radtka JF 3rd, Proctor DN, Leuenberger UA, et al. Blood pressure and calf muscle oxygen extraction during plantar flexion exercise in peripheral artery disease. J Appl Physiol (1985) 2017;123:2-10. Baker WB, Li Z, Schenkel SS, Chandra M, Busch DR, Englund EK, et al. Effects of exercise training on calf muscle oxygen extraction and blood flow in patients with peripheral artery disease. J Appl Physiol (1985) 2017;123:1599-609. Manfredini F, Malagoni AM, Felisatti M, Mandini S, Mascoli F, Manfredini R, et al. Adynamic objective evaluation of peripheral arterial disease by near-infrared spectroscopy. Eur J Vasc Endovasc Surg 2009;38:441-8. Yamamoto K, Miyata T, Onozuka A, Koyama H, Ohtsu H, Nagawa H, et al. Plantar flexion as an alternative to treadmill exercise for evaluating patients with intermittent claudication. Eur J Vasc Endovasc Surg 2007;33:325-9. Bouyé P, Jacquinandi V, Picquet J, Thouveny F, Liagre J, Leftheriotis G, et al. Near-infrared spectroscopy and transcutaneous oxygen pressure during exercise to detect arterial ischemia at the buttock level: Comparison with arteriography. J Vasc Surg 2005;41:994-9. Jensen J, Lendorf A, Stimpel H, Frost J, Ibsen H, Rosenkilde P, et al. The prevalence and etiology of impotence in 101 male hypertensive outpatients. Am J Hypertens 1999;12:271-5. Michal V. Arterial disease as a cause of impotence. Clin Endocrinol Metab 1982;11:725-48. Martínez-Piñeiro L, Julve E, Martínez-Piñeiro JA. Topographical anatomy of the penile arteries. Br J Urol 1997;80:463-7. Mahé G, Leftheriotis G, Picquet J, Jaquinandi V, Saumet JL, Abraham P, et al. Anormal penile pressure cannot rule out the presence of lesions on the arteries supplying the hypogastric circulation in patients with arterial claudication. Vasc Med 2009;14:331-8. Potthast S, Schulte A, Kos S, Aschwanden M, Bilecen D. Blood oxygenation level-dependent MRI of the skeletal muscle during ischemia in patients with peripheral arterial occlusive disease. Rofo 2009;181:1157-61. Kemp GJ, Hands LJ, Ramaswami G, Taylor DJ, Nicolaides A, Amato A, et al. Calf muscle mitochondrial and glycogenolytic ATP synthesis in patients with claudication due to peripheral vascular disease analysed using 31P magnetic resonance spectroscopy. Clin Sci (Lond) 1995;89:581-90. Coolen SA, Daykin CA, van Duynhoven JP, van Dorsten FA, Wulfert F, Mathot J, et al. Measurement of ischaemia-reperfusion in patients with intermittent claudication using NMR-based metabonomics. NMR Biomed 2008;21:686-95. Pipinos II, Shepard AD, Anagnostopoulos PV, Katsamouris A, Boska MD. Phosphorus 31 nuclear magnetic resonance spectroscopy suggests a mitochondrial defect in claudicating skeletal muscle. J Vasc Surg 2000;31:944-52. Jiji RS, Pollak AW, Epstein FH, Antkowiak PF, Meyer CH, Weltman AL, et al. Reproducibility of rest and exercise stress contrast-enhanced calf perfusion magnetic resonance imaging in peripheral arterial disease. J Cardiovasc Magn Reson 2013;15:14. Segall GM, Lang EV, Lennon SE, Stevick CD. Functional imaging of peripheral vascular disease: A comparison between exercise whole-body thallium perfusion imaging and contrast arteriography. J Nucl Med 1992;33:1797-800. Cosson E, Paycha F, Tellier P, Sachs RN, Ramadan A, Paries J, et al. Lower-limb vascularization in diabetic patients. Assessment by thallium-201 scanning coupled with exercise myocardial scintigraphy. Diabetes Care 2001;24:870-4. Stacy MR, Zhou W, Sinusas AJ. Radiotracer imaging of peripheral vascular disease. J Nucl Med Technol 2015;43:185-92. Pande RL, Park MA, Perlstein TS, Desai AS, Doyle J, Navarrete N, et al. Impaired skeletal muscle glucose uptake by [18F] fluorodeoxyglucose-positron emission tomography in patients with peripheral artery disease and intermittent claudication. Arterioscler Thromb Vasc Biol 2011;31:190-6. Kramer CM. Skeletal muscle perfusion in peripheral arterial disease a novel end point for cardiovascular imaging. JACC Cardiovasc Imaging 2008;1:351-3. Tellier P, Lecouffe P, Vasseur C. Whole-body exercise thallium imaging in smokers. Vasc Med 1998;3:15-20. Jacquinandi V, Bouyé P, Picquet J, Leftheriotis G, Saumet JL, Abraham P, et al. Pain description in patients with isolated proximal (without distal) exercise-related lower limb arterial ischemia. Vasc Med 2004;9:261-5. Picquet J, Jaquinandi V, Saumet JL, Leftheriotis G, Enon B, Abraham P, et al. Systematic diagnostic approach to proximal-without-distal claudication in a vascular population. Eur J Intern Med 2005;16:575-9. Jaquinandi V, Abraham P, Picquet J, Paisant-Thouveny F, Leftheriotis G, Saumet JL, et al. Estimation of the functional role of arterial pathways to the buttock circulation during treadmill walking in patients with claudication. J Appl Physiol (1985) 2007;102:1105-12. Ouedraogo N, Feuilloy M, Mahe G, Leftheriotis G, Saumet JL, Abraham P, et al. Chest tcpO2 changes during constant-load treadmill walking tests in patients with claudication. Physiol Meas 2011;32:181-94. Abraham P, Colas-Ribas C, Signolet I, Ammi M, Feuilloy M, Picquet J, et al. Transcutaneous exercise oximetry for patients with claudication – A retrospective review of approximately 5,000 consecutive tests over 15 years. Circ J 2018;82:1161-7.